Hi, my name is keith and I live in wales UK. I have been bodyboarding for 18 years now and do understand a certian ammount about surfboard board design. Recently (since a friend got one and I had a go) I have been thinking of getting a fibreglass paipo, so i need some help with the design. 1 bodyboard have zero rocker at the rear and basically have a bit of nose kick in the front 6" will this work on a stiff fiberglass board? 2 I have been considering fins, but seeing I dont have them on my bodyboards dont think I need big ones, have been looking at either FCS etc twins fin set ups or getting the 4 fin bonzer set up so I have 2 small and 2 large to swap between. 4, A body board is 2" thick how think am I going to need this thing to be? 5, rail design. i'm used it we pretty basic 50/50 bodyboard rail what would you suggest? I have been bodyboarding for 18 years now and do understand a certain amount about surfboard board design. Yes. Although there are many theories about rocker in board design I find that our very short boards (in contrast to vertical riding) do not require as much rocker for wave entry (nose) and turning (rear rocker) and nose/tail rocker is not much of factor in paddling (drag). Full body rocker would be another thing both for riding the wave (planing) and paddling (drag). 2 I have been considering fins, but seeing I don't have them on my bodyboards don't think I need big ones, have been looking at either FCS etc twins fin set ups or getting the 4 fin bonzer set up so I have 2 small and 2 large to swap between. I use small sidebites on my Austin paipo design (see http://mypaipoboards.org/skegs/MySideBites.shtml) along with a smallish center fin (4 to 6 inches, but the last few years mostly a 4" or 4.5"), adjusted forward and aft in a standard Fins Unlimited center fin box. In my 3-fin set-up, I have found that standard surfboard sidebites are just too large (3.25" is about the smallest they come), particularly on re-entry turns and quick pivots. My roughly 2" sized sidebites appear to be the sweet spot. I favor less toe-in than is customary. There are some pics of my boards on MyPaipoBoards.org (MyBoards). Although I really like Futures fins boxes the FCS fin boxes with two female slots provide more flexible fin placement adjustments when using an FCS fin with a single center male (rather than the customary double male). Tradeoff between large vs. small fins and placement forward or aft from the tail. A bodyboard has a lot more float than a poly/glass board -- maybe more like an EPS/epoxy board. 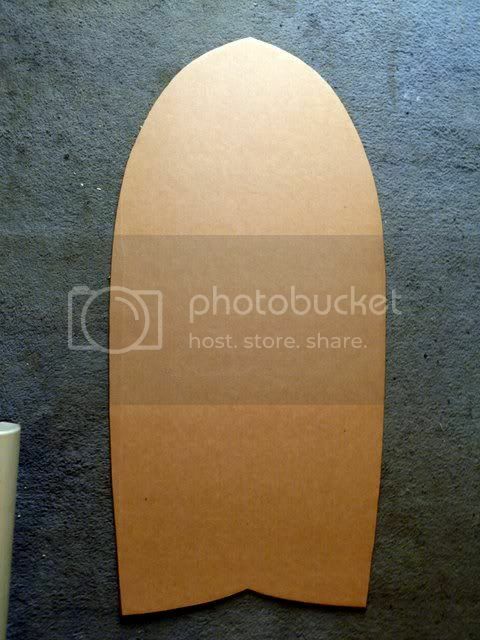 I always feel that my baseline Austin board, 50 x 20.25 x 2.5 inches, has less float than a standard 42" bodyboard. My Austin Checkered RPM has even less float at 50 x 20 x 2.25 inches. The RPM is easier to duck dive and is really nice in reef/point breaks -- the baseline design rides well everywhere but I use it for slower, mushier waves and in cold water East Coast USA surf that is under 6 foot (more float with all that rubber on). I like mine. Look at the Austin boards carefully. Look at the Paul Gerard? interviews on this site for starters. The greater the control surfaces (fins) the greater the drag. Insert fins follow fashion and greater thought on shape and transition to the hull is required for bellyboard use. Placement is determined by both hull form and rider. Don't have fins offset (toe in)!!! so your saying have both fins pointing straight ahead?